The NGINX check is included in the Datadog Agent package, so you don’t need to install anything else on your NGINX servers. If the command output does not include http_stub_status_module, you must install an NGINX package that includes the module. You can compile your own NGINX-enabling the module as you compile it-but most modern Linux distributions provide alternative NGINX packages with various combinations of extra modules built in. Check your operating system’s NGINX packages to find one that includes the stub status module. NGINX Plus packages prior to release 13 include the http status module. For NGINX Plus release 13 and above, the status module is deprecated and you must use the new Plus API instead. See the announcement for more information. On each NGINX server, create a status.conf file in the directory that contains your other NGINX configuration files (e.g. /etc/nginx/conf.d/). NGINX Plus can also use stub_status, but since that module provides fewer metrics, you should use status if you’re a Plus user. Set the nginx_status_url parameter to http://localhost:81/nginx_status/ in your nginx.d/conf.yaml file to start gathering your NGINX metrics. See the sample nginx.d/conf.yaml for all available configuration options. Note: If you are using the NGINX Plus, for releases 13 and above, set the parameter use_plus_api to true in your nginx.d/conf.yaml configuration file. Optional - If you are using the NGINX vhost_traffic_status module, set the parameter use_vts to true in your nginx.d/conf.yaml configuration file. Restart the Agent to start sending NGINX metrics to Datadog. Change the service and path parameter values and configure them for your environment. See the sample nginx.d/conf.yaml for all available configuration options. Run the Agent’s status subcommand and look for nginx under the Checks section. (gauge) The number of connections waiting on upstream responses and/or writing responses back to the client. (gauge) The number of keep-alive connections waiting for work. (gauge) The number of connections reading client requets. (gauge) The total number of active connections. (gauge) Rate of requests processed. (gauge) Rate of connections opened. (gauge) Rate of connections dropped. (gauge) The total number of accepted client connections. (count) The total number of accepted client connections (shown as count). (gauge) The current number of active client connections. (gauge) The total number of dropped client connections. (count) The total number of dropped client connections (shown as count). (gauge) The current number of idle client connections. (gauge) Time of the last reload of configuration (time since Epoch). (gauge) The ID of the worker process that handled status request. (gauge) The total number of abnormally terminated and respawned child processes. (count) The total number of abnormally terminated and respawned child processes (shown as count). (gauge) The current number of client requests. (gauge) The total number of client requests. (count) The total number of client requests (shown as count). (gauge) The total number of requests completed without sending a response. (count) The total number of requests completed without sending a response (shown as count). (gauge) The number of client requests that are currently being processed. (gauge) The total amount of data received from clients. (count) The total amount of data received from clients (shown as count). (gauge) The total number of client requests received from clients. (count) The total number of client requests received from clients (shown as count). (gauge) The number of responses with 1xx status code. (count) The number of responses with 1xx status code (shown as count). (gauge) The number of responses with 2xx status code. (count) The number of responses with 2xx status code (shown as count). (gauge) The number of responses with 3xx status code. (count) The number of responses with 3xx status code (shown as count). (gauge) The number of responses with 4xx status code. (count) The number of responses with 4xx status code (shown as count). (gauge) The number of responses with 5xx status code. (count) The number of responses with 5xx status code (shown as count). (gauge) The total number of responses sent to clients. (count) The total number of responses sent to clients (shown as count). (gauge) The total amount of data sent to clients. (count) The total amount of data sent to clients (shown as count). (gauge) The total number of successful SSL handshakes. (count) The total number of successful SSL handshakes (shown as count). (gauge) The total number of failed SSL handshakes. (count) The total number of failed SSL handshakes (shown as count). (gauge) The total number of session reuses during SSL handshake. (count) The total number of session reuses during SSL handshake (shown as count). (gauge) A boolean value indicating whether the server is a backup server. (gauge) The total number of client connections forwarded to this server. (count) The total number of client connections forwarded to this server (shown as count). (gauge) Total time the server was in the “unavail” or “checking” or “unhealthy” states. (gauge) The total number of unsuccessful attempts to communicate with the server. (count) The total number of unsuccessful attempts to communicate with the server (shown as count). (gauge) The total number of health check requests made. (count) The total number of health check requests made (shown as count). (gauge) The number of failed health checks. (count) The number of failed health checks (shown as count). (gauge) Boolean indicating if the last health check request was successful and passed tests. (gauge) How many times the server became unhealthy (state “unhealthy”). (count) How many times the server became unhealthy (state “unhealthy”) (shown as count). (gauge) The ID of the server. (gauge) The total number of bytes received from this server. (count) The total number of bytes received from this server (shown as count). (gauge) The time (time since Epoch) when the server was last selected to process a connection. (gauge) The total number of bytes sent to this server. (count) The total number of bytes sent to this server (shown as count). (gauge) How many times the server became unavailable for client connections (state “unavail”). (count) How many times the server became unavailable for client connections (state “unavail”) (shown as count). (gauge) Weight of the server. (gauge) The current number of servers removed from the group but still processing active client connections. (gauge) Current time since Epoch. (gauge) The current number of idle keepalive connections. (gauge) The current number of active connections. (gauge) The time (since Epoch) when the server became “unavail” or “unhealthy”. (gauge) Total time the server was in the “unavail” and “unhealthy” states. (gauge) The total amount of data received from this server. (count) The total amount of data received from this server (shown as count). (gauge) The total number of client requests forwarded to this server. (count) The total number of client requests forwarded to this server (shown as count). (gauge) The total number of responses obtained from this server. (count) The total number of responses obtained from this server (shown as count). (gauge) The time (since Epoch) when the server was last selected to process a request (1.7.5). (gauge) The total amount of data sent to this server. (count) The total amount of data sent to this server (shown as count). (gauge) How many times the server became unavailable for client requests (state “unavail”) due to the number of unsuccessful attempts reaching the max_fails threshold. (count) How many times the server became unavailable for client requests (state “unavail”) due to the number of unsuccessful attempts reaching the max_fails threshold (shown as count). Not all metrics shown are available to users of open source NGINX. Compare the module reference for stub status (open source NGINX) and http status (NGINX Plus) to understand which metrics are provided by each module. nginx.net.reading The current number of connections where nginx is reading the request header. nginx.net.writing The current number of connections where nginx is writing the response back to the client. The NGINX check does not include any events. Returns CRITICAL if the Agent cannot connect to NGINX to collect metrics, otherwise OK. 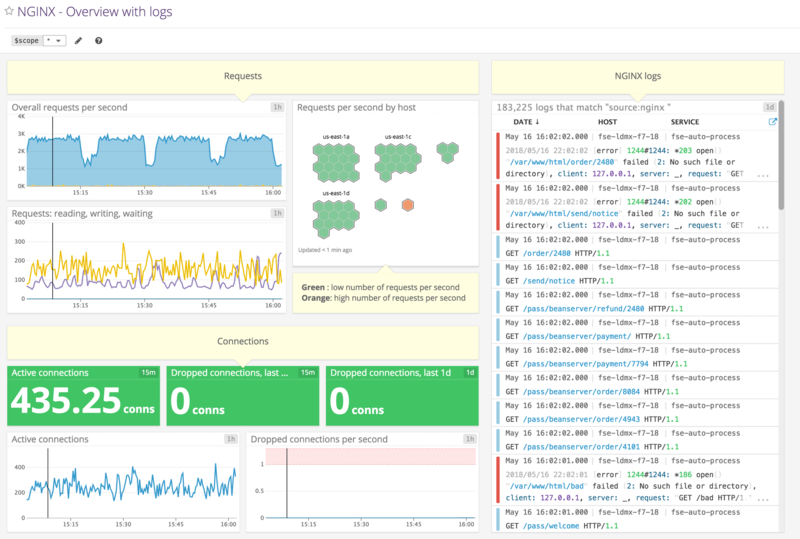 Learn more about how to monitor NGINX performance metrics thanks to our series of posts. We detail the key performance metrics, how to collect them, and how to use Datadog to monitor NGINX.